Little Emily is not your typical child. 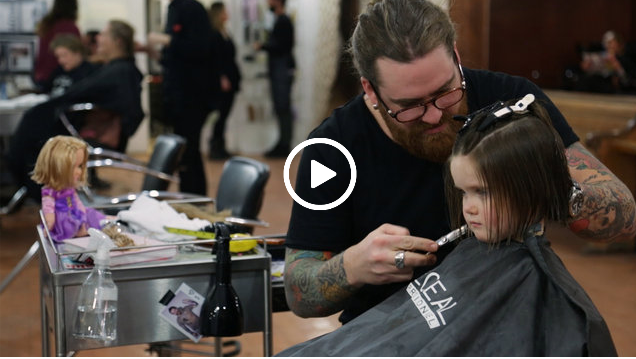 At the age of 3, she understands the power or giving and decided to cut her golden brown locks and give her hair to kids with cancer who have lost theirs. Thanks to FlyPressFilms.com, Emily’s spirit of giving was captured on video as sweet as can be. Emily’s parents suggested the idea by showing her pictures of children with no hair, explaining that her hair could be turned into a wig for a child with cancer. Emily happily agreed to donate her hair, and had her uncle Matthew do the cutting. Emily’s message of help has resonated with a lot of people, within 4 days the video of her kindness had over 70,000 plays on Vimeo alone. Emily donated her hair to an organization called 360 Hair in Langley, British Columbia. They accept 6″ minimums while most other places require 8-10″. If you know someone who wants to donate, please consider 360 Hair, which can be reached at 855-510-1128. Share this post if little Emily has inspired you, she has definitely inspired us!